I have loads of them, and will list more soon. Ozzy Osbourne - Bendable Figure 6" Tall. Condition is Very Good. Dispatched with Royal Mail 2nd Class. This item is a totally unique, hand-carved beer can featuring a portrait of Black Sabbath legend Ozzy Osbourne! The effect works by placing a tealight candle inside (the base is cut out so the can fits over it) allowing the light to shine through the carving creating this amazing silhouette image which looks very cool in a darkened room… Makes a great one-off gift and a must have for any Ozzy Fan! This sweatshirt has never been worn & is still in near perfect condition (just needs a good iron!). Black Sabbath Live At Hammersmith Odean Numbered Limited Edition. Condition is immaculate never been played kept in bubble wrap. Collectable item only 5000 made, comes with its unique number 4782/5000. Will send signed for. OZZY OSBOURNE - BLACK SABBATH. YOU TO OWN THIS UNIQUE RARE OZZY OSBOURNE. RARE SIGNATURE / AUTOGRAPHED PHOTOGRAPH. DIRECT FROM THE UK. STUNNING MUSEUM GRADE REPRODUCTION ENABLES. THE ULTIMATE "PRINCE OF DARKNESS" COLLECTABLE. funko pop ozzy osbourne. Great Condition Still In Box. Rare Condition is Very Good. Dispatched with Royal Mail 1st Class. Grab the bargains before other people can! Randy Rhoads' Black Jackson Prototype. Randy felt the shape of his first prototype 'Concorde' was not distinctive enough from the Gibson Flying V and his solution involved elongating the top horn so that the body resembled a shark's fin. Ozzy Osbourne china mug in good condition no chips or cracks. Has motif 'Sharon I can't drink coffee I am the Prince of Darkness' on side. 4.5 ins high. Think it may have had musical contraption in base judging by hole underneath but that is gone. Mug looks ok anyway. BLACK SABBATH. the majority have the date written at the edge of the cutting or on the reverse. 36 CUTTINGS. BLACK SABBATH. 3 small Concert Adverts from 1980. the majority of them have the date at the edge of the cutting or on the reverse. THIS RARE ITEM WAS PRODUCED BY F4A CORP IN 2002. IT STANDS APPROX 8" (20CM) HIGH AND IS MADE FROM STURDY MOULDED PLASTIC WITH MONEY SLOT IN BACK. SEE PICTURES. As is the nature of the Industry, autographs and signatures can vary ever so slightly - we may have more then one of a particular item, if so the item you will receive will be exactly as pictured, but the autograph maybe placed slightly differently. The box includes planchette. Manufactured by Hasbro. CONDITION : VERY GOOD - NEWSPRINT PAPER. NOT A REPRINT IN ANY WAY. Buy it now. Ozzy Osbourne 18” Figure Blizzard Of Ozz In Good Condition. This figure is good in detail and great for any collector Shipped with USPS Priority Mail. Ozzy Osbourne ticket Blizzard of Oz Canterbury Odeon 21/10/80. 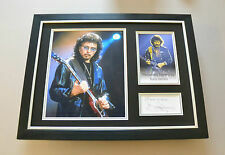 Rare ticket from the above concert. Ozzy Osbourne/ Snow Globe/ Blizzard of Ozz/ Excellent Condition/ Randy Rhoads!!! 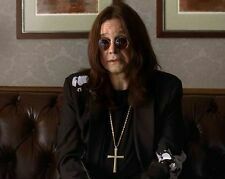 Ozzy Sharon Jack Kelly. 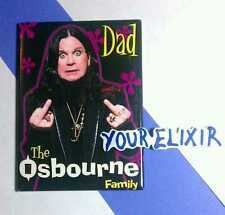 The Osbourne Family High Ball. Drinking Glass in Original Box. Original Press Promo Slide Negative - Ozzy Osbourne - 1980's - Good condition. Rock Headliners XL Figure Ozzy Osbourne Bark At The Moon 2000. THIS IS IN VERY GOOD CONDITION. IF YOU HAVE ANY QUESTIONS FILL FREE TO CONTACT ME ANYTIME. The image is 2 original Canadian 2014 Black Sabbath & Ozzy Osbourne back catalogue A5 flyer. Condition is excellent plus. Flyer is double sided. Both images shown as 2 are for sale here. Available is a new very rare The Osbourne family Ozzy Osbourne Collectible Plush Doll. 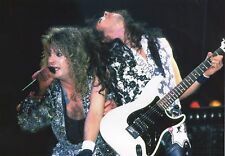 OZZY OSBOURNE / RANDY RHOADS Banner. 3 feet tall x 1.8 feet wide. THE PROGRAM:This is an original program from Black Sabbath's 1978 "Tenth Anniversary World" tour with Van Halen. If there is a problem, we will do everything we can to make it right. If we can't, don't worry. OZZY OSBOURNE ozzy Osbourne ~ 1983 MUSIC SONG BOOK! A rare original UK music score paperback song book. This is a basic music song book published in the 1980’s featuring guitars chords and lyrics. An early musical edition of works, long deleted and now out of print. CANDLE NOT INCLUDED. THESE WERE USED ON DISPLAY BUT ORIGINAL BOX INCLUDED. A note about our products - We hand pick each piece and only. What's in the pictures is what's included nothing more nothing less. Only 500 of each design were manufactured and we are down to the last ones at below wholesale pricing. The overall display is 12x15. The heavy duty rock n roll black wood plaque is coated with a scratch resistant material and is ready to hang. Ozzy Osbourne Wall Clock RARE! 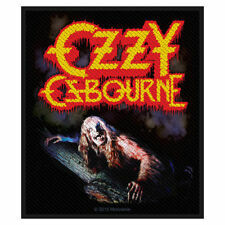 Cartoon Ozzy Chainsaw! OZZY OSBOURNE Blizzard of Ozz 24 KT GOLD SIGNED AUTOGRAPH FRAMED DISPLAY LIM950! Rare LA Roxx Original 1994 Ozzy Osbourne Leather Jacket-one Of A Kind!! !